When it comes to daily rituals there’s one thing I can’t live without and that’s my shower. Unfortunately our shower decided to die a few weeks back so I’ve been resorting to sitting in the bath tub with one of those shower heads that attaches to the taps. It’s not as bad as it sounds, but it’s definitely no power shower! It works fine though, except for when it comes to rinsing out my shampoo/conditioner from my masses of hair which now takes an age and a half! 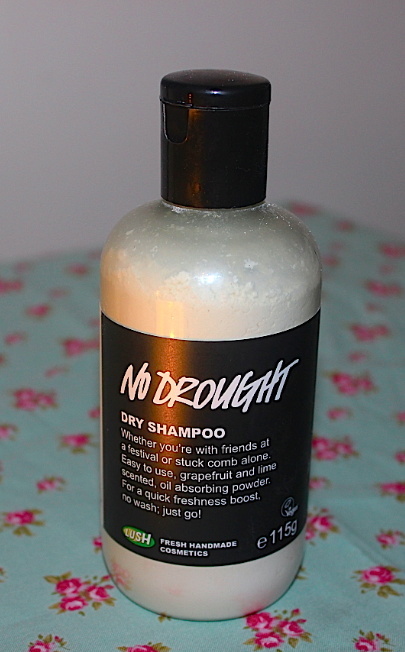 Thankfully the lovely Katie from Gold Dust had just blogged about Lush’s No Drought Dry Shampoo which sounded like just the thing I needed for those “can’t be bothered” mornings. At £6 it’s pricier than most dry shampoos but it’s also a lot bigger and a little goes a long way. I reckon this bottle will easily last 6 months if not more. It has a light, refreshing lime and grapefruit scent which helps you feel fresh but isn’t overpowering. As a huge lover of all things citrus this is the perfect dry shampoo for me. 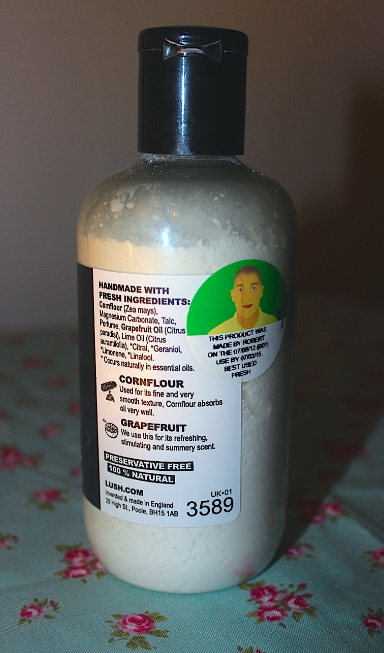 As with all Lush products the No Drought dry shampoo is 100% natural, using cornflour to soak up excess oil whilst the grapefruit scent leaves you smelling fresh. Best of all though is the cute little sticker telling you who made your bottle. Mine was made by Robert. Thanks Robert!